Before the big wings, before the hawk eyes and the blob eyes and the bug eyes, there was the 1992 Subaru Legacy RS Type RA, STI’s first car. It’s still one of the coolest machines the in-house performance arm ever made. If you haven’t noticed already, there’s a lot of Subaru stuff on Jalopnik as of late, and much of that is just to do with Subaru having several significant anniversaries at the moment. 2018 marks the 50th anniversary of Subaru of America, as well as the 30th of Subaru Tecnica International (STI) itself. It’s STI’s anniversary that brought this car to mind, as the great Japanese Nostalgic Car posted it up on Instagram yesterday right at the same time as I was looking at a brochure of it, at which point I started spamming all of my colleagues with old photos and specs and figured, hell, I’m pretty much obligated to write about it at this point. I remember this Legacy mostly for carrying the more hippie kids to school when I was growing up, not taking flying leaps across East Africa in the Safari Rally, or tearing sideways through the dirt in New Zealand for Colin McRae’s first WRC win. But I shouldn’t be too dismayed. This is an easy one to forget, as Subaru’s rally history really hit is highest peaks with the Impreza WRX STI, and that’s where its tradition continues today. But that’s not where the tradition started. Before campaigning the Impreza in the World Rally Championship, Subaru ran its boxy first-generation Legacy family sedan. What I find hard to understand about this particular Legacy, though, is that I understood the Impreza WRX and WRX STI to be homologation specials, but it doesn’t seem like the Legacy RS Type RA exactly was, or at least I can’t find any reference of it being one. Rather, the Type RA was described at the time as more of a promotion than anything else. 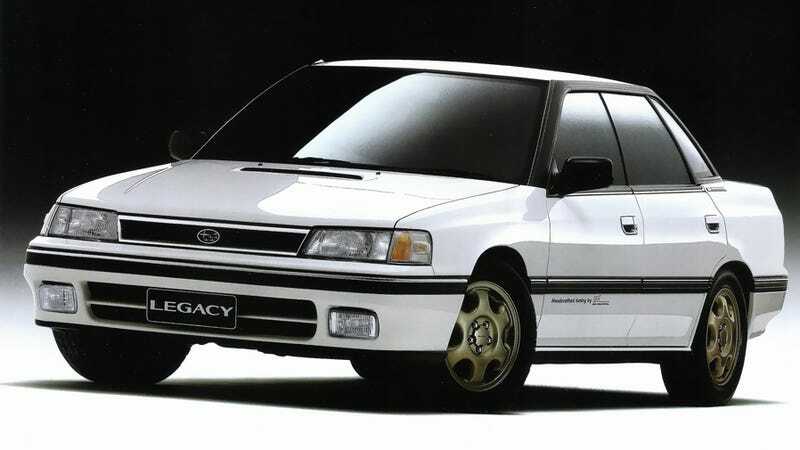 In 1989 Subaru debuted this first generation Legacy, and to promote it, Subaru (or rather a young STI) ran it in a 100,000 km endurance trial with minor modifications. It managed the run in 19 days, which was apparently a world record of some kind, and was proudly touted in Subaru’s promotional material at the car’s debut. Also promised in that literature: a road-going version of that record car, first referred to as a “GTI” or Gran Turismo, as you can see in the lower right corner of the 1989 Tokyo Motor Show handout above. As such, it’s sometimes wondered if “RA” stood for “Record Attempt” rather than “Rally,” though that distinction is kind of pointless. It wasn’t long after that, though, that the Type RA became a regular (if low-volume) model, just not one we ever got in America. I particularly love that the body was unmodified. All you got was a Legacy RS Type RA badge at the back and “Handcrafted tuning by STi” along the doors. If there ever was a sleeper, it was this thing. It made 220 horsepower and 198 lb-ft of torque from its turbo EJ20 2.0-liter boxer four and pushed around a rather porky 3,400 pounds (1555 kg) per Subaru’s own official specs. Still, it was about as fast point-to-point as anything else on the road in its day, thanks to its good suspension and all-wheel drive. I will also take a minute to point out STI’s speed parts catalogue from this time, which included not only badges and anti-roll bars, but also skidplates and a roll cage. Nice. Also in 1992 you could order an STI v-neck sweater, the sight of which sends me clicking over to eBay faster than I should admit. What’s interesting about this Legacy RS Type RA today is that even though it’s a car we can import today, there isn’t really a great reason to do so. Anyone can go out and buy a manual-transmission Legacy from this era for a few hundred bucks, swap in a later engine, upgrade the suspension and have a car as fast if not faster than this original. There is a vast world of performance upgrades for Subarus that make buying this specific car unnecessary. But really, that’s the legacy of this car (pardon the pun). The Legacy RS Type RA got this Subaru speed thing going. Though it’s obsolete, there’s still a lot we have to thank it for. If only Subaru could bother to make the modern Legacy so cool.